Jaikoz is a Java based ID3 Tagger for tagging with large music collections. Jaikoz is a Java based ID3 Tagger designed for dealing with large music collections. It has a number of automation features such as rename tag from filename without the filename format being known and rename file from tag. 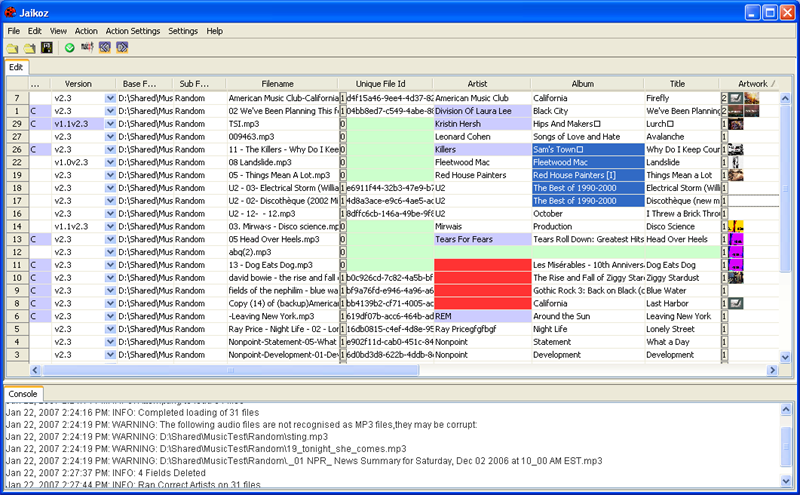 Jaikoz is a Java based ID3 Tagger designed for dealing with large music collections. Intelligent AutoMatch compares different Audio files and finds field matches and then allows all similar fields to be formatted the same. Intelligent AutoFormat provides automatic capitalization, conversion of special words and removal of invalid and punctuation characters. AutoCorrect can be used to perform automatic formatting of your chosen columns in a single click. The innovative split screen spreadsheet view allows easy editing of all fields. Provides full support of all text fields and partial support of all other fields. Full Unicode support allow any character from any language to be used. Easy conversion of tags between version. Displays what is actually contained in the tag allowing the user full control.